Either DeMaio and his aides are lying, or his accusers are. Our first step in getting to the bottom of it all: clarifying what role Peters played in this scandal. The Election Night party for Democrats held at the Westin downtown was unusually elated, considering the drubbing their colleagues across the country had taken. It was obvious why. 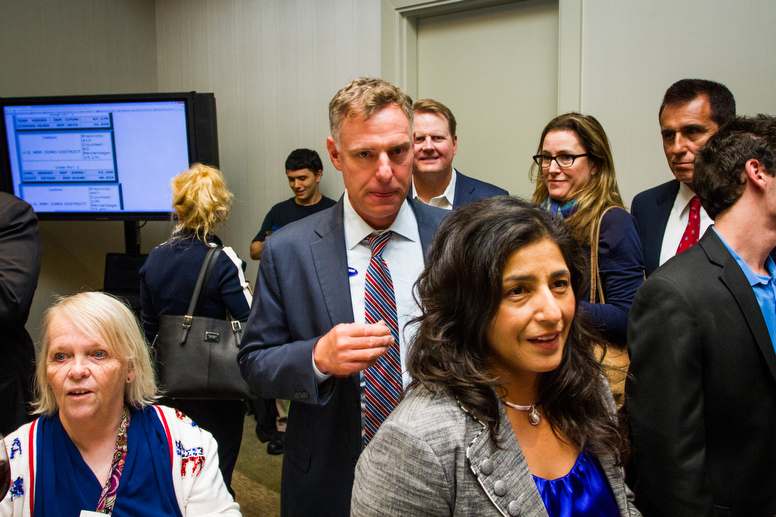 Rep. Scott Peters may have been behind Republican Carl DeMaio in the early vote returns, but he was close enough that many seemed confident he would eventually win. They were right. Many saw the end of DeMaio in the results, and this made them jubilant. One visitor showed up at the Democrats’ party with a smile too: Todd Bosnich, the former DeMaio staffer who had accused DeMaio of sexually harassing him over a period of months before firing him and offering $50,000 to stay quiet. Bosnich has never hidden his desire to destroy DeMaio politically. And yet, as police reports of his political movements behind the scenes started to surface last week, some saw them as an indictment of Bosnich and his supposed complaint. It’s as though you can’t both be the sincere victim of sexual harassment and want to destroy someone politically. To Bosnich, though, they were one and the same. He had to destroy DeMaio’s political career, he said, to stop him from hurting anyone else. If you believe his story, it makes sense. But after refusing to discuss the details of Bosnich’s allegation during the campaign, DeMaio is now working to prove he was the real victim. It was not that voters did not like DeMaio’s policies. It was not that he ran an inferior campaign. It was not that he was too divisive or failed to rally an army of supporters. He wants you to think he is the victim of a historic and absurdly far-ranging fabrication. Thanks to NBC 7 San Diego and U-T San Diego, the public has those new police reports. The documents have set the stage for a second contest, post-election. This one pits DeMaio against his accusers. Either DeMaio and his aides are lying, or his accusers are. In fact, one side is weaving a tale so vicious, they should never be taken seriously in public affairs again. That’s why we have to find out the truth. My first stop is to clarify what exactly Peters’ role in this scandal was. Let’s start with some key dates. Sometime in mid-May, Bosnich was fired from the DeMaio campaign. He says it was May 19. He says he confronted DeMaio about the alleged sexual harassment and when he showed up the next day at work, he was fired, offered money and another job. But he told police, according to the recently released search warrant affidavit, he was fired May 26. The DeMaio campaign has itself been wildly inconsistent on this question of when Bosnich was fired. It has, at different times, said Bosnich was fired May 5, May 14 and May 22. DeMaio campaign manager Tommy Knepper told police that on May 12, the day the notorious plagiarism scandal erupted, he told Bosnich that he would no longer be doing research for the campaign, and that on May 14, he told Bosnich he’d be getting his final paycheck the next day and would no longer be an employee — but he could still volunteer. According to this version, Bosnich left the campaign by May 23. In yet another claim, DeMaio’s team told the U-T’s Adrian Vore on May 20 that Bosnich had left the campaign two weeks before then. That would be May 5. This is MaryAnne Pintar, Peters’ campaign manager, in front of and to the right of Peters. According to the police affidavit, Pintar called the police on May 31. She said Bosnich had emailed her two days earlier and told her he was the victim of sexual harassment by DeMaio. She sent the emails to police investigators. They interviewed her that evening. The emails “contained campaign strategy and campaign-specific information from DeMaio’s campaign that appeared not to be for public release.” She then said she got another email, in which Bosnich was contemplating whether he had the courage to contact police. She also told police Bosnich had made it clear he wanted to keep DeMaio from winning “and being able to further harass and violate” employees. She said she’d finally decided to call the police when she asked Bosnich if he was OK and he did not respond. And then he did discuss it. On June 9, Pintar called police again. This time, she said, she was spooked about car break-in near her house. She had met Bosnich in person a few days earlier, on June 5, she told them. And he gave her an envelope. In the envelope was a copy of a 27-minute audio interview Bosnich had recorded with KFMB’s Mike Slater that never aired. It outlined his whole story about the sexual harassment. You can listen to it here, thanks to CityBeat. Also included were printouts of campaign mailers the DeMaio campaign planned to use. Pintar told me she did not think much of them. They did not seem helpful. “There was nothing ever reported that somehow this was something that might have been taken in the break-in,” she said. I asked Pintar why Bosnich was coming to her. “He told me he came to me because, if Carl went to Congress, he would do this to other people and he didn’t have anywhere else to turn,” Pintar said. She said that she made copies of everything. She was heading to Hawaii on vacation and told the police in that June 9 call that she would leave the information with Peters. Peters gave it to his wife, because he was heading to D.C.
Police retrieved the information from Peters’ wife on June 11. I asked Pintar who else she gave the information to. Did she give it to CNN? “I gave it to my attorney and the police,” she said. She did not give it to CNN, she said, after I pressed her again. She also denied sending it to other media or to the Democratic Congressional Campaign Committee. A few months later, CNN would blow everything wide open when it aired Bosnich’s allegation. Police would later show the documents that Pintar got from Bosnich to DeMaio and determine that they were stolen from the campaign. They secured a search warrant of Bosnich’s home and executed it. But he was never arrested. The district attorney said she didn’t have the evidence to make an arrest. We now know that Pintar, Peters’ campaign manager, got documents from Bosnich on June 5. She told police about them June 9 and police picked them up June 11. The police later concluded they were stolen. But on Oct. 17, during the recording of a televised debate at NBC 7 San Diego, the media and the public didn’t know any of those things. That’s what made one question from DeMaio to Peters so shocking. “Did your campaign come into possession of our strategy book, all of our direct mail pieces in the last five months?” asked DeMaio. Peters said his team got some information and he never saw it. “We turned it directly over to the police within 24 hours of getting it because what was contained in it was potentially part of a criminal investigation,” he said. That was not true. It was only after these police affidavits were released that Peters, on Twitter, admitted he “misstated the timeline.” But he also claimed he never saw them. At the very least, he handed the envelope to his wife so that the police could pick it up after he left for a trip back to Washington D.C. This is the most damning thing DeMaio has on Peters and the congressman’s role in his supposed smearing. But DeMaio’s story requires its own leaps of logic, and has left me with a picture of a campaign teeming in orchestrated deception. I’ll work on that story next.